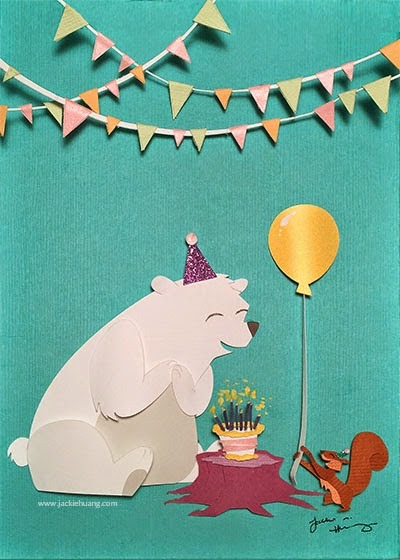 It's by BEAR-thday Celebration! Join me in celebrating my birthday! First, enjoy 30% off all items (including originals) in my Etsy shop by entering "HAPPY30" during check out. Sale lasts February 24 - March 4, 2015. Then participate in my first giveaway! I'll be giving away a FREE copy birthday card featuring the illustration above, plus a FREE copy of my book to one winner on Tumblr, Facebook, and Twitter. That's (3) winners total. Best of all, I'm giving away the ORIGINAL paper sculpture to one winner via Instagram! Be sure to read the image details per account for how to enter. Winners will be choose on Monday, March 2, 2015.